bDepartment of Medical Imaging (D.J.M. ), The University of Toronto, The University Health Network, The Toronto Western Hospital, Toronto, Ontario, Canada. SUMMARY: This review article explains the methodology of breath-hold cerebrovascular reactivity mapping, both in terms of acquisition and analysis, and reviews applications of this method to presurgical mapping, particularly with respect to blood oxygen level–dependent fMRI. Its main application in clinical fMRI is for the assessment of neurovascular uncoupling potential. Neurovascular uncoupling is potentially a major limitation of clinical fMRI, particularly in the setting of mass lesions in the brain such as brain tumors and intracranial vascular malformations that are associated with alterations in regional hemodynamics on either an acquired or congenital basis. As such, breath-hold cerebrovascular reactivity mapping constitutes an essential component of quality control analysis in clinical fMRI, particularly when performed for presurgical mapping of eloquent cortex. Exogenous carbon dioxide challenges used for cerebrovascular reactivity mapping will also be discussed, and their applications to the evaluation of cerebrovascular reserve and cerebrovascular disease will be described. 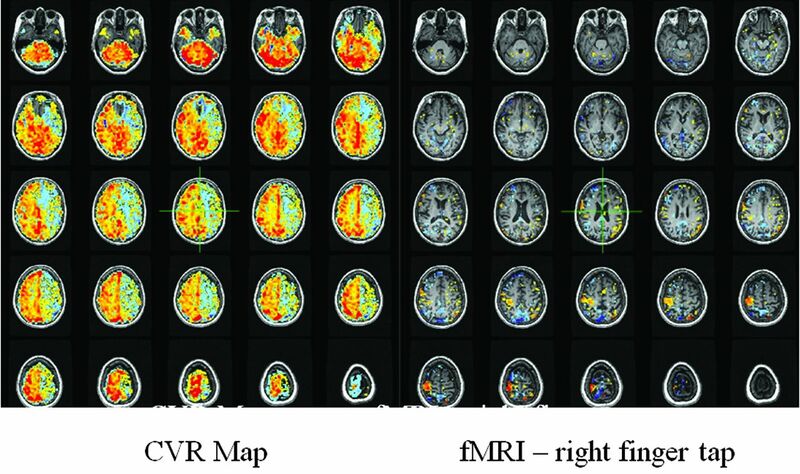 While in healthy volunteer BOLD fMRI studies and fMRI studies involving patients without regional hemodynamic alterations or abnormalities of arterial or venous vasculature, the neurovascular coupling cascade can be assumed to be intact, the same is not necessarily true for patients with intracranial mass lesions, brain AVMs, cerebral infarctions, or cerebrovascular disease. In these latter cases, the neurovascular coupling cascade may break down at any level from the proximal neuronal end (in the case of nonviable or impaired cortex) to the distal microvascular response. This phenomenon is referred to as neurovascular decoupling or neurovascular uncoupling (NVU). In most cases in which electrical activity is present in viable but nevertheless diseased cortex, the breakdown may occur at the astrocytic, neurotransmitter, or, most often, the vascular “end organ” level. In these cases, evaluation of cerebrovascular reactivity (CVR) can be a useful method for detection of NVU potential. NVU is a critical problem in presurgical fMRI because it can manifest as false-negative activation on BOLD fMRI tasks. Unlike in the research setting, where the emphasis typically is on reduction of false-positives (type I statistical errors) by use of stringent statistical thresholds or use of corrections for multiple comparisons, in clinical presurgical fMRI, the emphasis is on the avoidance of false-negatives (type II errors). False-negative activation on clinical fMRI can lead to serious consequences because it may result in inadvertent resection of eloquent cortex that appears BOLD-“silent” or -“invisible” on BOLD activation maps because it may be incapable of displaying a robust or even minimal BOLD response to an appropriate neural stimulus. Similarly, NVU may result, in some cases, in false-positive activation that could result in insufficient resection of a lesion such as a tumor, and this may adversely affect the patient's overall prognosis. In such a setting, the ability to detect NVU may be critical for patient care because it may necessitate the use of complementary electrophysiologic evaluation (ie, intraoperative cortical stimulation mapping) for the reliable mapping of such eloquent cortex. It is well-known that in cases of high-grade glioma, tumor angiogenesis is associated with abnormal vasoactivity and permeability of the neovasculature; thus, NVU is a recognized phenomenon in this subset of patients with brain tumor.7 However, it has recently been demonstrated that similar NVU can occur with lower grade tumors as well.8⇓–10 In the case of low-grade gliomas, the exact mechanism responsible for the NVU is not clear but may be associated with astrocytic dysfunction related to the infiltrative tumors. The prevalence of NVU in brain tumors is quite high according to recent series,8⇓–10 though the examples in these series suggest that NVU may not necessarily be an all-or-none (ie, binary) phenomenon, but rather may be present to variable degrees, resulting in variable degrees of reduction of expected ipsilesional BOLD activation in eloquent cortical regions and complete absence of detectable activation only in some cases.10 Detection of such NVU potential is critical for adequate interpretation of clinical BOLD fMRI activation maps because false-negative activation may be present, depending on the statistical thresholding used. Similar NVU can be seen in AVMs due to regional hemodynamic abnormalities related to the exhaustion of vascular reserve secondary to arteriovenous shunting and loss of perfusion pressure or venous congestion with high outflow resistance. Other studies have suggested that use of end-expiration BHs results in greater reproducibility than end-inspiration BH techniques because end-expiration offers a more natural resting equilibrium state involving the diaphragm, lungs, and chest wall before initiation of a BH challenge.13,17 Thomason and Glover18 have even suggested that the BOLD response resulting from end-expiration BHs is slightly different from that of end-inspiration BHs in that the latter involves more of a biphasic BOLD response, which is less desirable.13 One major perceived limitation of BH techniques for CVR mapping is the problem of compliance-related poor repeatability in the setting of neurologically impaired patients. Unlike with exogenous CO2 administration, where precise quantitative assessment of partial pressure of carbon dioxide and partial pressure of oxygen levels and controlled administration of inhaled CO2 can be assured, with BH techniques, patient performance can substantially affect these parameters. To allay these concerns, Bright and Murphy13 studied 12 healthy volunteers who performed a BH task simulating differing degrees of task compliance with recording of their expired (end-tidal) gas O2 and CO2 levels. They noted that while all BH challenges are associated with a mild hypoxia effect in addition to the intended hypercapnia, the effect of the hypoxia is minimal, and by using end-tidal CO2 as a regressor in their general linear model analysis, repeatable measurements of BOLD signal change as a measure of CVR were possible.13 Furthermore, their results are consistent with those of Tancredi and Hoge,19 who used a similar BH paradigm and reported that the mild hypoxia induced by the BH task did not significantly affect their CVR results. At Johns Hopkins, we have developed a BH CVR protocol that has been successfully implemented in approximately 95% of patients who have undergone routine clinical BOLD fMRI presurgical mapping examinations during the past 4 years. The technique uses 16-second BH blocks that produce consistently robust BOLD signal changes with minimal patient discomfort. The much longer regular breathing (control) blocks allow equilibration of the BOLD signal following each BH hypercapnia challenge. Unlike the protocol used by Bright and Murphy,13 which used end-expiration BHs, at our institution we have adopted end-inspiration BHs because in our experience, it has been easier for neurologically impaired patients to perform end-inspiration BHs. We use a slow, controlled 4-second inspiration before a 16-second BH period, which is then followed by a 40-second block of self-paced normal breathing; this cycle is repeated 4 times, and at the end of the last BH period, an additional 20-second period of normal breathing is incorporated for a total task duration of 4 minutes 20 seconds. The advantages of the BH technique in patients with neurologic impairment, compared with exogenous CO2 administration methods, are that no equipment setup time is needed either outside or within the MR imaging scanner and there is no need for the use of a nasal cannula or facemask. Use of facemasks as part of breathing circuits or gas delivery systems may be uncomfortable for neurologically impaired patients who may be undergoing multiple challenging BOLD functional activation paradigms in the same lengthy MR imaging session, especially with additional physical constraints imposed by the use of a head coil, head padding, headphones and video goggles, or other fMRI stimulus-presentation hardware (eg, screens/mirrors mounted on a head coil when projector systems are used). Monitoring of patient task performance can be achieved via the use of a standard respiratory belt (provided by most major MR imaging scanner vendors), which is applied by the MR imaging technologist before the start of the scan session. Real-time monitoring of patient task performance can be accomplished via evaluation of the respiratory waveform/bellows; if regular frequency of respirations and consistency of chest wall excursion amplitude are not observed during the initial run, then the task will be repeated, typically with observed improvement in the degree of task compliance and resultant reduction of physiologic noise on the brain BOLD CVR maps. Despite concerns in research studies regarding the lack of absolute quantification of CVR by using BH CVR mapping, variable repeatability/reproducibility, and variable patient compliance, as discussed above in detail, we have found such a technique to be perfectly adequate for regional relative CVR assessment in the setting of structural brain lesions such as brain tumors. In such cases, for the detection of NVU potential, we only need to assess relative CVR (ie, ipsilesional regional CVR relative to normal contralateral hemispheric cortical CVR). Furthermore, we stress the need for patient practice in a prescan training session for the following reasons: 1) Assessment of adequate patient task performance can be made, 2) patient familiarity with the task instructions can ensure excellent task compliance, and 3) patient anxiety can be minimized before scanner bore entry. The MR imaging technologist then repeats the instructions for further reinforcement immediately before actual patient performance of the BH paradigm in the scanner. Such prescan training can be accomplished in approximately 5 minutes for most patients and can be incorporated into a longer prescan training session for clinical fMRI presurgical mapping examinations. We have reported, in several articles, the feasibility of the use of our protocol in patients with brain tumor at 3T.8,9,10,21 We have observed similar success at higher field strengths. Figure 1 shows an example of a patient with a left perirolandic low-grade glioma who performed the identical BH protocol at both 7T and 3T. A patient with a left perirolandic low-grade glioma who performed the identical breath-hold protocol at both 7T and 3T. Notice the higher resolution of the 7T imaging due to inherently higher signal-to-noise ratio; the BH CVR map at 7T (A) was thresholded to 0.5% positive BOLD signal change during hypercapnia relative to baseline, whereas the BH CVR map at 3T (B) was thresholded at 0.175% positive BOLD signal change. Comparable results are noted at both field strengths in terms of NVU detection potential. There are some contraindications, however, to the performance of the BH task. These include patients with dementia or profound language-comprehension difficulties and patients with severe visual impairment who cannot read the visual textual cues that are used as instructions for the task inside the scanner. Furthermore, patients with a large body habitus who are literally too large to fit inside the bore of the MR imaging scanner or who are too large to allow sufficient chest wall excursion within the scanner bore generally cannot perform the BH task. In addition, patients with severe respiratory disorders such as emphysema or chronic bronchitis who may have elevated baseline partial pressure of carbon dioxide levels may not experience the same degree of hypercapnia during performance of a BH task as a person with normal respiratory status; thus, BOLD CVR mapping using a BH task may not be successful in these individuals. The following clinical case exemplifies the value of BH CVR mapping in clinical presurgical mapping BOLD fMRI examinations. Figure 2 demonstrates a 41-year-old ambidextrous (but primarily right-handed) male patient with a large infiltrative nonenhancing T2/FLAIR hyperintense left temporal lobe low-grade oligoastrocytoma (World Health Organization grade II) who had undergone previous subtotal resection approximately 2 years before presentation and now presented with prominent tumor progression. Although a mild degree of functional Wernicke area convergent activation was seen along the posterosuperior margin of the mass, the full extent of Wernicke area activation and inferior parietal lobule (receptive language) activation could not be reliably determined. Prominent regional decrease in CVR on the BH CVR maps in the lateral left temporal lobe cortex in the areas of tumoral infiltration strongly suggested NVU in this clinically asymptomatic patient. Activation from 5 different language tasks (silent word generation, sentence completion, rhyming, reading comprehension, and passive story listening) was displayed in both sagittal and axial anatomic overlays on postcontrast T1-weighted anatomic images. Note the relative paucity of language activation in the left temporal lobe, which is likely to be due to NVU. The respiratory signal/bellows tracing demonstrates excellent task performance. In light of these limitations of fMRI localization, the patient underwent awake craniotomy with intraoperative cortical-stimulation mapping. A large left temporal lobe recurrent nonenhancing low-grade oligoastrocytoma in a 41-year-old ambidextrous (but primarily right-handed) male patient. A, The prominent regional decrease in CVR on the BH CVR maps (thresholded at a positive 0.35% BOLD signal change during hypercapnia relative to baseline) along the lateral tumor margin as manifested by discontinuity of the cortical “ribbon” of red CVR signal change. Although a mild degree of functional Wernicke area activation is seen along the posterosuperior margin of the mass (B), the full extent of Wernicke area activation and inferior parietal lobule activation could not be reliably determined in light of the NVU potential suggested by the abnormally decreased regional CVR. B, Activation from 5 different language tasks (silent word generation in red, sentence completion in yellow, rhyming in light blue, sentence reading comprehension in green, and passive story listening in purple), overlaid on both sagittal and axial postcontrast T1-weighted 3D MPRAGE images. Note the relative paucity of activation overall in the left temporal lobe. The respiratory bellows are displayed in the bottom half of the figure (C), in which the y-axis represents the amplitude of the respiratory waveform in arbitrary units, while the x-axis represents the timing of the respiratory chest wall movements in minutes. Note the periodic chest wall movements during the breathing blocks of the paradigm and the relatively flat baseline during the breath-hold blocks. Excellent task performance is noted. As flow resistance increases due to either inflow or outflow obstruction, a vasodilatory response will develop in normal segments of the vasculature to maintain blood flow. Exhaustion of vascular reserve occurs when this compensatory mechanism reaches a maximum. Under these conditions, it is thought that no further vasodilation is possible even to other vasodilatory stimuli, including those of neuronal origin. If neurovascular coupling is exhausted, then blood flow augmentation in response to neural activation will not occur and BOLD signals will not show the expected increase, resulting in type II errors during fMRI experiments. When testing CVR by using a CO2 stimulus in patients with any of the disease conditions that alter vascular resistance, the manner in which CO2 is applied is the least critical element in assessing the effect of the disease on tissue reactivity. More critical are the methods used to analyze the relationship between CO2 changes and blood flow. 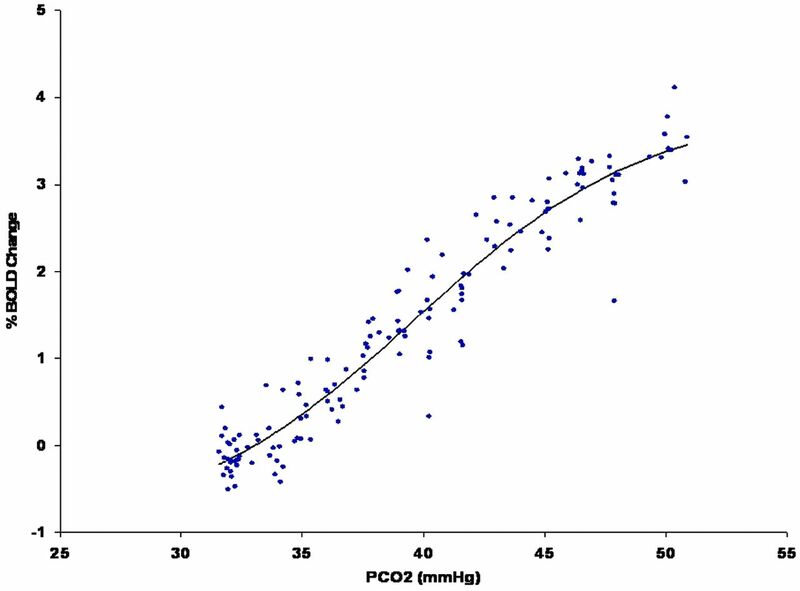 If the need for reproducibility is important, then knowledge of arterial CO2 levels is critical. The relationship between CO2 and blood flow follows a sigmoidal curve (Fig 3). Because vascular reserve is consumed through compensatory vasodilation in response to increasing vascular stenosis (resistance), no change in reactivity will be observed because the sigmoidal curve is relatively linear over a wide range. However, with additional increases in vascular stenosis, the slope of the curve decreases, indicating a leveling off of reactivity to the same incremental change in CO2. Further increases in stenosis will lead to maximal vasodilation. The vascular bed cannot respond to further elevations in CO2. At this point, flow resistance has reached an absolute minimum. When this condition is observed clinically, blood flow in the affected vascular territory becomes blood pressure–dependent and hemodynamic transient ischemic attacks or even stroke can occur. If a global vasodilatory stimulus occurs such as hypotension or hypercapnia, then steal phenomena can develop, in which blood flow is directed away from the territory that is maximally vasodilated. Mapping those areas in the brain that have this physiology is useful for stratifying the risk of ischemic injury (2–5 times higher if steal is present22⇓⇓–25) and for validating the ability of the tissue to respond to an fMRI stimulus (Fig 4). Data from healthy controls showing the relationship between the percentage change in the BOLD signal as a function of increasing arterial partial pressure of carbon dioxide. 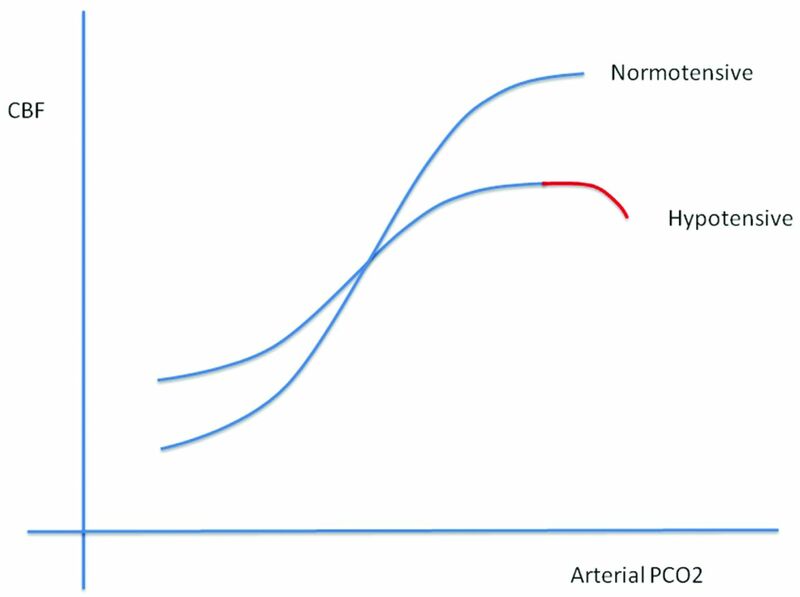 Note the sigmoidal shape of the curve with maximum slope at approximately 40 mm Hg, which is the typical value of resting arterial CO2. This is the point of maximum reactivity and maximum vascular reserve. CVR map on the right obtained in a patient with high-grade stenosis of the left internal carotid artery. Red, yellow, and orange indicate degrees of positive BOLD signal during a CO2 stimulus of 10 mm Hg above resting levels. Blue indicates a decrease in BOLD signal representing steal physiology in the left anterior cerebral artery and MCA territory. This territory would not be expected to show any response to an fMRI experiment that would activate tissue in the regions. A standard right-sided finger-tap motor paradigm shows only right-hemispheric activation. This should not be interpreted to mean that the right hemisphere is controlling right hand movement. It is a type II error caused by neurovascular uncoupling. The issue becomes more complex, however, when reserve in the impaired tissue is not fully exhausted. If the tissue retains some vasodilatory capacity, then a small CO2 stimulus should elicit a positive BOLD response. A slightly higher CO2 stimulus, however, may exhaust the tissue's reserve; with normal tissue lowering flow resistance to a greater degree, flow will be directed away from the tissue with lower initial reserve. The presence or absence of steal physiology therefore becomes dependent on the magnitude of the applied CO2 stimulus and the difference in vascular reserve between tissue perfusion beds. The importance of this observation is that a perfusion bed with positive reactivity at low CO2 stimuli may become exhausted and develop negative reactivity (ie, decreased blood flow in response to higher CO2 levels, ie, steal physiology) (Fig 5). The slope of the sigmoidal curve decreases secondary to hypotension. The vasodilatory response to CO2 is reduced because some vascular reserve is expended to maintain blood flow at normal levels. Note the red portion of the curve that indicates a drop in flow with high CO2 stimuli. Although not discussed in the article, we believe that this is a reflection of data points representing steal phenomena. This drop would be expected earlier (smaller elevations in CO2) in vascular beds exposed to higher proximal resistances as in carotid stenosis. Adapted with permission from BMJ Publishing Group Limited. Harper AM, Glass HI. Effect of alterations in the arterial carbon dioxide tension on the blood flow through the cerebral cortex at normal and low arterial blood pressures. J Neurol Neurosurg Psychiatry 1965;28:449–52. If a supramaximal stimulus is applied (acetazolamide), then that vascular territory in the brain with the lowest vascular reserve may show steal physiology even if there is only marginal steno-occlusive disease affecting this tissue. Even the normally perfused brain would be expected to show this effect under a maximal stimulus because flow resistance (impedance) in gray matter and white matter perfusion beds differs considerably. White matter–penetrating arteries have resistances typically >3–4 times higher than those of penetrating arteries in the cortex.26⇓–28 In view of the added complexity rendered by the total of these issues, accurate assessment of the state of CVR deficits requires measurement of the entire vasodilatory portion of the sigmoidal curve (resting partial pressure of carbon dioxide level to 15–20 mm Hg above the resting level). This would require precision control of CO2, preferably holding arterial O2 constant while mapping CVR for all increments of CO2 from resting values to marked hypercapnia. In general, this is impractical without application of CO2 protocols that incorporate this entire range of stimuli. Reasonable estimates of reactivity can be obtained by using known step changes in CO2 stimuli, such as resting CO2 compared with resting CO2 + 10 mm Hg or even with BH techniques. BH techniques, however, pose unique challenges to CVR analysis to be discussed next. If follow-up CVR mapping is needed after treatment interventions, then a highly reproducible vasodilatory stimulus is preferred. If the primary clinical goal is to apply fMRI tools for presurgical localization of eloquent cortex in relation to brain neoplasms, then reproducibility is not as much of a concern in this single-use setting. The primary concern under these conditions is to adequately interrogate the tissue for evidence of exhausted reserve. If one assumes “ideal” conditions by using “noise-free” BOLD acquisitions, vascular beds that are maximally vasodilated will show blood flow reductions to tiny elevations in CO2. Therefore, BH techniques that produce small-but-gradual increases in CO2 would easily detect areas with exhausted reserve. Furthermore, quantitation of BOLD signal change is not necessary because only the presence of BOLD signal decrease, not the magnitude of the decrease, is needed to generate maps of exhausted reserve. The elegance of this construct lies in its independence from any form of thresholding for distinguishing normal-from-abnormal perfusion beds. Simply observing the direction of the change in the BOLD signal in response to the stimulus is all that is required. CVR maps can then be simplified showing areas of positive and negative change. The magnitude of change is not needed. In real life, the BOLD signal is not perfect and control of CO2 is not perfect. There is considerable noise in BOLD images requiring repeated application of stimuli during image acquisition to extract signal in a statistically meaningful fashion from the noise. The well-known low-frequency baseline drift of BOLD signals must also be accounted for. The CO2 stimulus, therefore, must be large enough to lower the BOLD signal sufficiently to survive the statistical requirements for significance. Increasing the duration of image acquisition can also help to improve signal, but there are practical limits in doing so. Most interesting, absolute adherence to BOLD signal decreases in response to vasodilatory stimuli may be too extreme. Small BOLD increases, for example on the order of a 10% threshold or less, may be acceptable for predicting clinically relevant type II fMRI errors. The real threshold for this is not currently known. However, if small positive BOLD responses are considered acceptable, then a greater degree of complexity is introduced into the analysis. If the CO2 stimulus is small, it may become very difficult to distinguish tissue with vascular impairment from normal tissue because both may show positive responses. If a slightly larger CO2 stimulus is then provided, previously positive-reacting tissue may then show a negative response when the limit of vasodilation is reached. Because the levels of CO2 achieved with BH CVR are unknown and because the presence of BOLD signal change in impaired tissue is dependent on CO2 elevations achieved, the final CVR maps would be expected to have lower prediction accuracy for type II fMRI errors than those in which tight control of CO2 is applied. Nevertheless, it is foreseeable that population-based BH CVR standardization, including duration of BH, number of repeats, minimum BOLD SNR requirements, and methods of data analysis, should help to alleviate this issue. The methods used to analyze breath-hold CVR data deserve comment. Compared with controlled CO2 data in which the stimulus is precisely known, breath-hold CO2 levels are unknown and there is no reference CO2 waveform for regression against the BOLD signal. The relationship between the time the individual begins breath-holding and the subsequent rise in brain blood CO2 is unknown. Clearly some delay needs to be applied to generate the highest correlation between CO2 and the BOLD signal. We have empirically found this to be approximately 11 seconds (unpublished data). Another method for assessing this correlation is to use the BOLD signal measured from a large purely venous structure such as the superior sagittal sinus. The temporal pattern of the signal change can then be used as the regressor for the correlation analysis. There is, therefore, no need to use a time delay for compensation because the signal in the brain and the sagittal sinus is virtually identical in time. However, we have observed differences between CVR maps generated by using the 2 analysis methods. More work in this area is clearly needed to establish preferred analytic approaches. BH results in a gradual increase in arterial CO2 concentrations, but there is considerable uncertainty about the levels of CO2 achieved in the blood. Exogenous administration of CO2 is an attractive alternative because measurement of end-tidal CO2 levels is enabled (as opposed to BH). This feature should theoretically permit accurate quantitation of CVR. In fact, elevation of arterial CO2 concentrations by using exogenous administration of CO2 has been in common use for many years. It is based on the assumption that sampling end-tidal CO2 under these circumstances is a reasonable approximation of the actual partial pressure of CO2 in the blood. The problem with this assumption is that end-tidal CO2 and partial pressure of CO2 are not equivalent because the method without re-breathing cannot account for the physiologic gradient between end-tidal CO2 and partial pressure of CO2. In young healthy individuals, the gradient is generally small but still unknown; therefore, quantitative errors in CVR will be present. The error will increase as a function of age, body position, exercise, and the presence of existing pulmonary disease.29 Furthermore, administration of exogenous CO2 can stimulate ventilation depending on the CO2 chemoreflex sensitivity of the individual so that partial pressure of CO2 may not change at all or may even decrease.28 Therefore, if quantitative CVR is required, simple mask application of CO2 stimuli is unsuitable. The ability to precisely control arterial blood gasses including CO2 and O2 independent of the respiratory rate and tidal volume is desirable for several reasons. Knowledge of arterial CO2 levels with high temporal resolution enables the application of the CO2 waveform as the preferred regressor against the BOLD data, yielding more accurate CVR values. Fluctuations in arterial O2 will also affect the BOLD signal independent of flow-related changes caused by CO2. Elimination of this confound is also desirable. BH CVR is simple, inexpensive, and easy to implement clinically because all that is necessary from the data-collection standpoint is to confirm that the subject can perform the maneuver as intended before scanning. The information gained can be extremely useful in validating the ability of a perfusion bed to respond to a vasodilatory stimulus, an essential requirement for applying reliable fMRI mapping. Limitations do exist, however, that require additional investigation before widespread use of BH techniques can be recommended for use in settings other than presurgical planning. Methodology that enables precise control of arterial blood gasses is preferred, but even though this methodology is available, it is not yet universally implemented. Nevertheless the importance of interrogating blood flow control and the state of vascular reactivity in the brain is expected to increase, gaining relevance in both clinical and research environments. Disclosures: Jay J. Pillai—OTHER RELATIONSHIPS: unpaid membership in Medical Advisory Board of Prism Clinical Imaging Inc. David J. Mikulis—UNRELATED: Grants/Grants Pending: Canadian Institutes of Health Research (CIHR) grant,* Comments: Agency: CIHR No. 130459, amount and period of support: $324,598 for January 10, 2013 to January 04, 2017; title: “A Potential Biomarker for Vascular Dementia,” Role: Principal Investigator; Patents (planned, pending or issued): US patent filing for “A New Method and Apparatus to Reliably Attain and Maintain Target End Tidal Partial Pressure of Oxygen and Carbon Dioxide,” July 22, 2004, provisional No. 60/589,797, applicants: Marat Slessarev, Joseph A. Fisher, Eitan Prisman, David Mikulis, Chris Hudson, Alex Vesely, George Volgyesi, Cliff Ansel; Stock/Stock Options: minor equity positions in Thornhill Research, Inc. *Money paid to the institution. This work was supported, in part, by grants from the Canadian Institutes of Health and the Johns Hopkins Brain Science Institute.